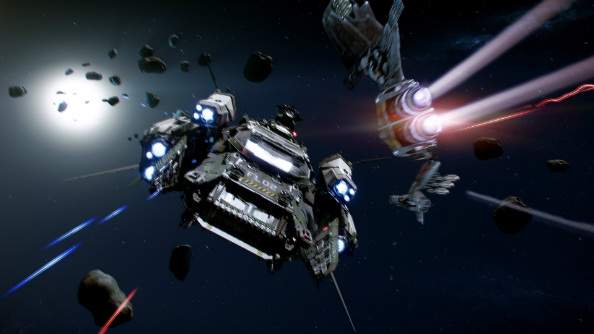 Following on from the recent news that Star Citizen’s social module is being launched, Cloud Imperium Games have released a video teasing what planetary landing will look like. The ship comes in low through the canyon of a desolate, rocky planet as the debris of an asteroid belt hangs on the horizon. You can make out the lights of some ground vehicles on the ground below to the left as the ship comes in for its landing, while steam vents from the planet’s core from a tear on the right. It’s absolutely stunning. You’ll be free to take it all in, too, because planetary landings will be automated, at least at launch. Once the landing animation is complete, the camera takes us on a short tour through a dilapidated, man-made cave beneath the planet’s surface. It’s extremely atmospheric and I kept expecting to see a facehugger scuttle along the floor, but obviously one doesn’t. You can see the video for yourself at this handy Vimeo link. It will be interesting to see if Cloud Imperium Games reacts to the manual planetary landing and fully explorable planets of Elite: Dangerous in its upcoming Horizons expansion. 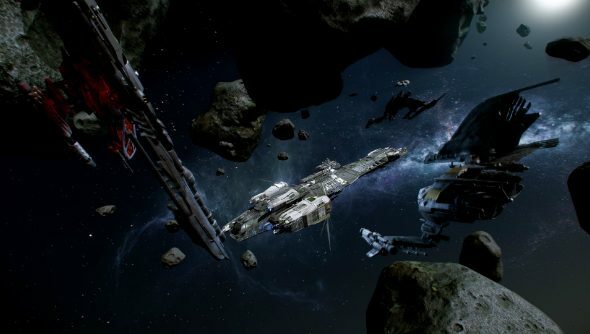 One thing is for sure, the space sim is an exciting genre right now and a bit of competition can only be a good thing. The videogame space race is truly on.